This topic contains 43 replies, has 11 voices, and was last updated by Oscarmax 1 month, 3 weeks ago. The start of this thread are from posts made elsewhere. I felt the topic deserved a thread of of its own for ease of reference. I believe a salesperson perception on if a person is disabled or not, is one they should keep to themselves. It’s unprofessional to comment on other customers. But this is the real world and of course the salesperson will say things to make you feel more valued and that they agree with you 100% – no salesperson would ever say to a motability customer that they think they are cheating the system. We all know there are people who are able to manipulate the rules, no system is 100% ‘cheat-resistant’ – but the majority will get found out sooner or later. The reason i wanted to continue this debate, as my wife doesn’t need a wheelchair all the time, on a good day she can manage short distance with just one crutch….. yet she tells me she sometimes feels that because she can do that, that people may look at her and think she is cheating the system and doesn’t deserve the benefit. This is of course her own insecurities, but that can manifest itself making her feel not wanting to visit a showroom, or other places, or park in a disabled bay for fear of judgement. Please may i ask we when posting we respect all contributors to the thread, thanks. And murder to colour match if you needed a panel painted. i wonder what dictates the current trend in car styling? Surely it’s not just the computer wind tunnel and air displacement that is responsible for a lot of new cars Now opting for Carp mouth (trout pout) if you know what I mean looking front end. Reading through these posts is upsetting to hear how horrible and malicious people can be, Jelous and envious people along with the busy bodies that have nothing better to do but interfere! Not one of you should ever feel ashamed, embarrass or feel as though you need to prove anything to anyone! It’s sad to read through this post and to have to feel what some of you fellow members have to and had to deal with! – I trained and worked hard in my trade since I left school (I was working before then for extra money) i worked so hard that Drs think the rate and the pace of my physical work I was doing could of controbuted to my illness and like everyone of us i didn’t ask for this! i had to give up my career, my wife too to care for me and our young children full time – We lost our home our cars and our lives, friends and family that didn’t understand or want to understand and we lost everything we had going for us. Life was turned upside down within a blink of an eye! Luckily im a big lad 6 1/2 foot 24 st and I can if needed look after myself so I don’t get the looks or the rude comments but my point is no one should have feel like they need to prove anything to anyone – no one knows what your story is where you have come from what you and your family have been put through, no one knows your situation and just because it “looks” ok it dosnt mean it is. My advice to everyone is to simply ignore the poisonous malicious individuals that might look at you in a certain way because at the end of the day them people arnt important in anyway in your life! I’ve learnt in the last few years that only think about and care about the people that love, care about and respect you – anyone else can go jump in a lake! For me, the root causes of the problem are two things, 1. that you are made to feel a cheat in claiming and 2. That the definitions of qualifying disablement are so ludicrous as to be meaningless. One of the things that has always surprised me is that although I feel disabled I am often taken as abled. That happens because no one except people I am close to see me throughout the day, and secondly I only go out when I can walk and I severely restrict my activities to ensure I can cope. The key with me has always been repeatability. I can walk a mile, Just go through the pain barrier and keep plodding on, but would then be housebound for a couple of weeks. I can walk a short distance most mornings, but can barely move most evenings. I do know that I limp more at times when I feel under scrutiny. That’s human nature I guess. My biggest problem is that I feel so strong and well that sometimes I stride out, only needs to be 10 paces of confident walking…..then have to have 3 days stuck in house with brufen gel and hot and cold packs. Spending life in the slow lane is hard work. 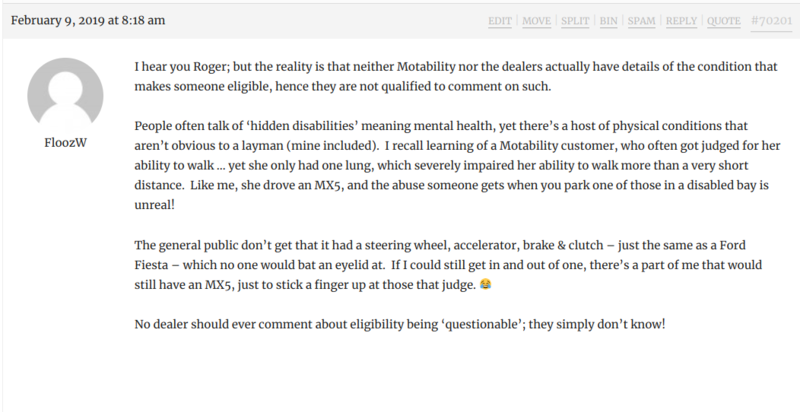 The other thing I have noticed is that for the bulk of people if you aren’t visibly and obviously disabled motability is often seen as one big scam perpetuated by the cheats or work shy. Especially Mail readers. There is too, a wider perception that we don’t really matter since we are not as a group as economically productive perhaps as other groups. Not obviously everyone, but enough people worn out by life and pain or disadvantaged in the labour market as to not reach their potential. I have read of premier league players parking side by side ferraris in disabled bays, whilst police looked on, and then did nothing about it. The cars were there for an hour whilst they lunched. it was a very busy road with a dearth of parking. God help anyone disabled, who has no visible signs of disablement, they face a lifetime of whispers and accusations. Yet, given no one has managed a body swap, disablement is a cross borne alone. I have only ever, and I am old, met one other person with my illness. Prior to the meeting I had fondly imagined that at last someone would ‘get’ me, that we would meet as if old friends and understand at once our travails and problems. We had absolutely nothing in common, physically, mentally, experientially, so how the hell could a PIP assessor relate to me, armed only with their inadequate training, prejudices and a clipboard. I passed the PIP. but two hours focussing on my inadequacies and failings after a lifetime of being told to try to be positive has to be one of the biggest downers around. Who the hell would want that as a regular occurence? Anyway, back to the subject. the hate and the remarks and the knowing looks would soon stop if the law was tweaked to allow us respond with a double barrelled shotgun. That would have two effects, deter the others and decimate the haters. Perhaps we should all become gun toting survivalists in the wilds of Montana, but then I wouldn’t need the badge to get to Sainsburys. No, this was Avon Beach. There’s no beach access for me from Top Car Park (was the Crows Nest car park, after the cafe that is now called the Cliffhanger). Hi, just reading through this and can totally identify. I have 2 long term chronic illnesses that effect my lungs and blood, whilst not visible, my lungs collapse at any time. More recent my back has ruptured, so I wear a body brace. A cross between a stab vest and a storm trooper. I look quite young and I always get the head shakes and the tuts, people staring so I open my jacket to show my brace, then when Im out my car and going into the shops they cant wait to hold a door to ask about my body brace as its so unusal. I then ask them if I didnt have my brace on would they be so nice, and every time the same answer, “Well you look ok and your young to” I even had this with a traffic warden, didnt ask no other person about their badge but me and then when he saw my brace said “Oh its OK’ Well its not OK, why should I be singled out because Im not 70+ years old? Im sick of getting Judged, “You must be a scounger as I have a nice car” “You must be faking it as your young” “It cant be that bad if you havent got a wheelchair or crutches” There are enough people out there who want to be nasty (DM or a start) so why do it to each other. To be honest the only time I voice up is when someone hasnt got a badge in a work van parked in a disabled space, then Im normally told to F&%koff. If I come across this scenario, and it’s not a ‘one man band business’, I report it to the business! I’ve never understood those that are in a company vehicle, clearly displaying the business name, that behave in such a manner. Most employers would be appalled too as it reflects on their business! I have to comment again as this has just happened. I went to the supermarket for my daily shop, parked in the bay, got my badge out as normal. Just as I was getting out the car a man kindly helped me and gave me a trolley. I didn’t get the chance to reply as he hurried off. I’ve got a 65 plate car. So judgemental: my late father used to buy a new car every three years, people do. As there is nothing on our vehicles to identify them as Motability vehicles, how would anyone know! FloozW – One evening I went to my Doctor’s Surgery and found the ‘Ground-keeper’s van parked in the ONE Disabled Parking space (!) so the poor dear had a nice wide space to park in plus he didn’t have to carry his strimmer an extra 30 ft from the free Public Car Park on the far side of the road. Robert – That wasn’t in Farnham, was it? The natives “Tut-tut!” particularly loudly there – possibly due to in-breeding. No, the edge of the fens Georgie, another den of inbreeding, luckily I’m on the good side of the edge. OK way off topic……….. Apparently the humble bicycle led to a spread of the gene pool. Before the bike it was too far for some to walk so isolated villages so the chances were high that you could be marrying your cousin etc. The bike made travelling easier so suddenly people could travel to other villages where they discovered that six toes could marry six fingers and produce normal offspring. Pity the upper classes never learned to ride. The problem with disabilities they are very hard to understand, how can I understand life as a blind person, someone in a wheelchair or an individual in extreme pain, I acquired a brain injury after an accident, I still don’t understand it and as hard as she tries neither can my wife. Non disabled have no real idea of our world, and before my accident neither did I. I like you have witnessed some phoney disabled people who when no one is looking miraculously become cured, you can understand why these people are sceptical. I just get on with my life I had some good CBT which taught me how to deal with it,if they chose to look down on me that’s fine at least they are leaving someone else alone. This reply was modified 2 months, 1 week ago by Oscarmax. Totally agree @oscarmax. I too have a brain injury, caused by a benign tumour and subsequent haemorrhage and craniotomy. My husband tries hard to understand, but doesn’t, and sometimes forgets completely – especially when we’re out together and within a few moments is walking 3 metres in front of me 😂😂 Sometimes I wish he could have just one day in my life, just to be able to experience it, but there again, I wouldn’t wish it on my worst enemy. I think it’s just a case of there are too many blue badges and not enough blue bays. Well here in London anyway. The council could add double the bays and there still wouldn’t be enough. I hate my incurable disabilities, though I live with them for years, it does make me angry that while I have no life, I’m judged by others once because of my age. Not now I’m older and grey. Plus because my movement is effected and some folk don’t allow you the time to even put your badge on display. it costs the nhs thousands a year in injections alone, without all the tablets etc to keep me going. if I want to drive I can’t take my full meds, the pain I put myself through so just so I can drive my car, my wife doesn’t drive, I know my kids at home will move away and I’ll no doubt have to come off the scheme. I bet each & every one of us could relay stories of verbal abuse – some more than others of course and to varying degrees. I know I could! The funny thing is it’s nearly always people who are just plain ignorant or simply uneducated in such issues. I had polio when I was 6-months old. My right leg is very thin, weak and pretty useless. In life, all it ever did was stop me following my father & joining the Royal Navy and driving a manual car (I can only drive an auto – which I do with my left leg). When I left school, all I knew was I wanted to see the big, wide world out there – somehow – so I managed to blag my way onto HM Ships by way of working for NAAFI. I spent 12-years at sea on aircraft carriers & Type-42 destroyers and actually got to see much of the world! I spent months in such beautiful places as the West Indies, America, The Seychelles, Sri Lanka, Kenya – to name but a few. Of course – I also had to take the rough with the smooth. I did two 6-month trips to the Middle East during the Iran-Iraq War escorting tankers through the Straits of Hormuz to protect them from Iranian war planes. But to get there – we had to transit the Suez canal several times which was fascinating in itself! Despite being a “civvie”, I opted to stay on board with my Navy mates (I was only 21 at the time) during the Falklands War of 1982 and I own a South Atlantic Medal with my name engraved on it which I’m quite proud of. My poor mum did nothing but worry herself to death for the whole duration… bless. I’ve seen whales galore in the oceans & a thousand dolphins. I’ve seen wild polar bears in the Arctic & penguins in the Antarctic. I’ve even seen the spectacular Northern Lights off Iceland – something I’ll never ever forget. Along the way – I met so many lovely, wonderful, interesting people from (literally) every walk of life. I’ve always said I wouldn’t swap those 12-years for anything in the world and I wouldn’t!!! The worst judges of disabled people are bloody atos assessors, I could knock them out if I was not so week due to there lies and incompetent judgments. Iean my last assessment they asked how long does it take me when I go to doctors to get from car to sitting Down and I said about 5 minutes with a couple of stops as it’s only about 20 meters from disabled bay…. She only mentioned that I can walk for 5 minutes with two stops that means I can walk more than 20 but no more than 50, she also said I have full range of movement in my wrists despite one of my wrist being in a full wrist and thumb splints lol… Luckily asking manditory consideration fixed it, but the letter of complaint I sent was 5 pages long to atos. Today I could not believe my next door neighbour she is 84 and as you can imagine due to her age struggles to walk great distances, although she does not use any walking aids at all, she has a mobility car which is of no issue to me. However I cannot believe her comments when I was using my walker this morning she asked me ‘ why I am I walking so slowly’ we were a bit gobsmacked ? This reply was modified 1 month, 3 weeks ago by Oscarmax. Philjb on Next Car Decision – Fiesta Or Something Else?